The federal government shutdown is now entering its second month. More than a week ago, it became the longest in the nation’s history and there are still no signs that it will end soon. As a result, 800,000 federal workers are going without pay even as many of them remain on the job. And for an increasing number, feeding their families is becoming an issue. In the Chicago area, some federal employees are visiting food pantries for the first time in their lives. 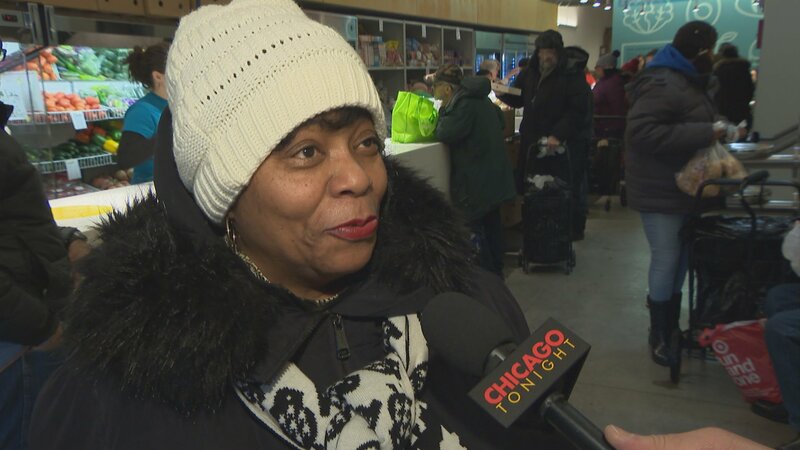 Hartfield was among at least two dozen furloughed government workers getting groceries Monday at the Lakeview Pantry in Chicago’s Uptown neighborhood today. Among them was Christina, a TSA agent at O’Hare Airport who is still on the job but not getting paid. Like other TSA workers, she’s missed one paycheck and is about to miss another, but has car and mortgage payments coming up. And in the meantime, she needs food. “I really feel weird about it,” said Christina, who did not want to give her last name. “I think there’s probably more people that need it more than I do but I don’t really have money for groceries so, I’m here. Lakeview Pantry serves about 8,000 people every year. And with the help of companies, philanthropies and even individual donors they’re able to keep up with the needs of the community. That need has increased as the federal shutdown drags on. “We let folks know that if you work for the federal government and you’re impacted by the shutdown you’re welcome to come here to receive groceries for your family,” says Kellie O’Connell, CEO of the Lakeview Pantry. “So far, in just about a week, we’ve seen over about a hundred families come through that don’t know where their next meal is going to come from,” she said. Judith Hartfield has worked for the U.S. government for more than 30 years. The Lakeview Pantry is far from alone in helping federal workers facing hard times. The Greater Chicago Food Depository says it’s being inundated with calls. Compounding food uncertainty among government workers and many others in the U.S. is the status of the federal Supplemental Nutrition Assistance Program (SNAP), often known as food stamps. That’s very worrisome for Kellie O’Connell of the Lakeview Pantry. “If SNAP is not available for the community both in Chicago and across the country, private philanthropy and non-profits like us cannot make up the slack,” she said.